Psoriasis is a non-contagious skin disorder that most commonly appears as inflamed red swollen skin lesions covered with silvery white scales. It is a genetically predisposed auto immune skin disorder. Some say it is caused by a fungus infection in the body or a "leaky gut" (partially digested protein snuck past the gut's entry and the liver's neutralizing enzymes making its way into the immune system). Psoriasis may be the result of the body's incorrectly metabolizing fat, because it is rarely seen in countries where diets are low in fat. Like eczema, it can be a very frustrating disease for dermatologists to treat. 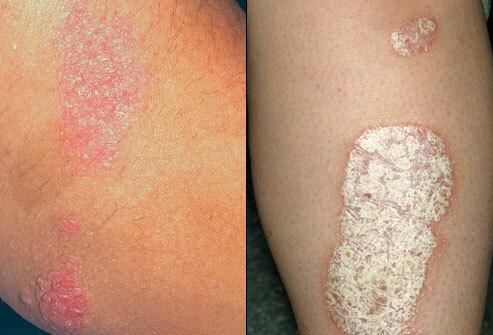 Psoriasis is the recurring growth of too many skin cells. Normal skin cells regenerate in 28 days, in psoriasis sufferers this happens in 5 to 7 days. Natural sunlight (UVB rays) can improve or even clear up psoriasis. This is why some are in remission during the summer months. Also swimming in salt water (the minerals are beneficial) seems to help relieve it as well. Coal tar is the oldest remedy for psoriasis, but topical and oral steroid medications are more widely used today. Oral medications include Methotrexate (most commonly used on severe psoriasis and is very toxic to the liver), Tegison, Differin, Accutane (used to treat acne), Soriatane, Cyclosporin A (helps to control the rapid growth of cells by suppressing the immune system). Dovonex (a Vitamin D compound) is a cream used to treat mild psoriasis. Enbrel is currently in FDA trials and is showing positive results in the treatment of psoriasis as well as rheumatiod arthritis. Anthralin is a topical medication that has been used for the last 100 years to treat this condition, but it does cause irritation to the surrounding normal skin. Topical retinoids such as Tazorac in combinations with other treatments also has a positive effect as does the new medication Stri-Vectin. Although the above medications may have undesirable side effects, they are still more effective than natural remedies such as hemp seed oil, Oregon grape root, and oil of Oregano. Emu Oil is every effective at relieving the itching and reducing the white scaly patches, although the red lesions can take much longer to disappear. Always use a mild cleanser (unscented body washes are best) to wash the effected patches followed by an exfoliant. Salicylic acid (beta hydroxy acid) in strengths of 1.8% to 3% is approved by the FDA as an over-the-counter treatment for psoriasis. Harsh exfoliants such as abrasive sea salt scrubs or any scrub containing sharp edges that can cut and irritate the skin are not recommended. Exfoliation of dead skin cells allows the Emu Oil to penetrate more efficiently and results will be more dramatic especially if the oil is applied 3 times daily. Emu Oil is most effective on psoriasis of the scalp. Massage a few drops oil into the scalp, let it sit for an hour or so and then shampoo hair. Better results are achieved by leaving in the Emu Oil over night and repeating daily until the you see improvement.